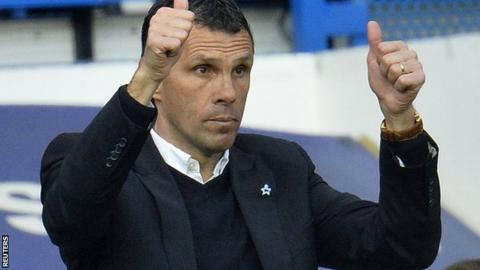 Manager Gus Poyet believes Sunderland can pull off a miraculous escape from Premier League relegation after they followed up a draw against Manchester City with victory at Chelsea. The Uruguayan said his side "needed a miracle" after losing at Tottenham on 8 April, but believes a "special" few days has created a "great opportunity". "On Wednesday at 5pm we were dead," said Poyet, whose side are bottom but now only three points away from safety. "If we don't stay up now it's a shame." Sunderland had lost seven of eight league games before taking a point at City in midweek and after the 5-1 hammering at Tottenham Poyet, 46, said his side "need something unique" and to create "a shock" in order to stay up. That duly arrived when Fabio Borini's late penalty condemned Chelsea to a first home defeat in 78 games under Jose Mourinho. Poyet joked he "expected a few texts" from fellow Uruguayan Luis Suarez, who is a striker for Premier League leaders Liverpool, after boosting the Merseyside club's title hopes. "As soon as I said we needed a miracle, things changed," added Poyet, who was greeted at Stamford Bridge by a banner from Sunderland fans reading "Miracles happen Gus". "The players kept believing. We needed something special and it happened in the last four or five days. "I'm a believer, I am committed and I know what we can do. With results like today you can expect anything from us. We looked dead on Wednesday afternoon and now we look a totally different team." Poyet's side face Cardiff, West Bromwich Albion and Swansea - three teams in the bottom eight- during their four-game run-in as they bid to avoid a first relegation from the top flight since 2006. Norwich, who are 17th, would open up a six-point gap to Sunderland if they beat Liverpool on Sunday, but Borini's 82nd minute penalty has undoubtedly offered the Black Cats hope. Mike Dean's award of the spot-kick when Cesar Azpilicueta fouled Jozy Altidore saw Chelsea assistant coach Rui Faria sent to the stands for his angry reaction. Afterwards, Blues' boss Jose Mourinho only offered one answer during his news conference, in which he "congratulated" both Dean and referees' chief Mike Riley. "We got a bit of luck when Cesar Azpilicueta slipped and let in Jozy Altidore," added Poyet. "It is a penalty that we can argue about all night. You don't get all of them, but this time we did."